I spent some time listening to ABC Classic’s Top 100 20th Century music last week. Not all the time, as I was at work for much of it, but I did catch some of it. Strictly of course it’s not the ABC’s top 100, but their listeners’. I think this point might have been forgotten by some of the people who called in to comment, and criticise the choice of music. The list was the choice of ABC listeners, or at least those who made the effort to vote, and as such the presenters can’t be held responsible. I was particularly struck by one caller who said that as soon as Elgar came on (I think Pomp and Circumstance, number 21) he turned off. The gist of his comment was that he was not prepared to listen to Edwardian English colonial propaganda, and judging by some of the comments on Facebook he was not alone. Personally I love it, memories of watching the Last Night of the Proms on TV, and I think the point is that it is a very evocative piece of music, it says what the nation felt at the time, and whether that feeling was moral or ethical or whatever doesn’t change the fact that it existed. Perhaps we know better now, perhaps not. If there is a group of people who could justifiably feel miffed about being under-represented in the listing then surely it is women. So far as I know there was only one women who made the list, which means all the other 99 pieces were written by men. In the nineteenth century this might have been expected, but in the twentieth? What is it about writing music which has made it such a male domain? If you considered writing as in literature, or painting or drawing, the inbalance would be far less. Elgar must be pretty popular amongst the ABC listeners, he got 5 pieces in the Top 100, and his cello concerto came in at number 1. One of the high ranking pieces which blew me away was Carmina Burana by Carl Orff. I knew the first part well, the O Fortuna as I now find it is called, from many TV commercials, movies etc. It immediately brings to mind the Old Spice TV commercial. I had never heard the whole thing though, and I loved it. So much so that I went online and found and ordered a CD copy of the recording which had just been played. The issue of CDs against MP3 music is something I have been thinking about recently, having just bought myself an MP3 player (one of the few which has nothing to do with a certain fruit). Looking for places to legally download MP3s though is not as easy as it would appear. Amazon won’t sell to Australia, although reading various forums it seems there are ways round that. I’m not sure I want to do that though, apart from the legality of it, my feeling is that if Amazon doesn’t want to sell to Australia, for whatever reason, then I’m not going to go round in circles trying to buy from them. ‘Get stuffed Amazon’ just about sums up my feelings! There are other sites, but they mostly seem to be biased towards current and popular music (nothing wrong with either, just not generally what I’m interested in). In the end I’m thinking that I will just continue to buy CDs and rip them onto my computer. At least that way I still have the CD, so if the computer dies or the MP3 player does then I just rip the CD again. Both seem to have a good selection, at least for the few random things I looked for. I have ordered from the Buywell site, look forward to listening to the music when it arrives. My orchid cactus has been flowering recently. For an ugly looking plant it does have beautiful flowers. 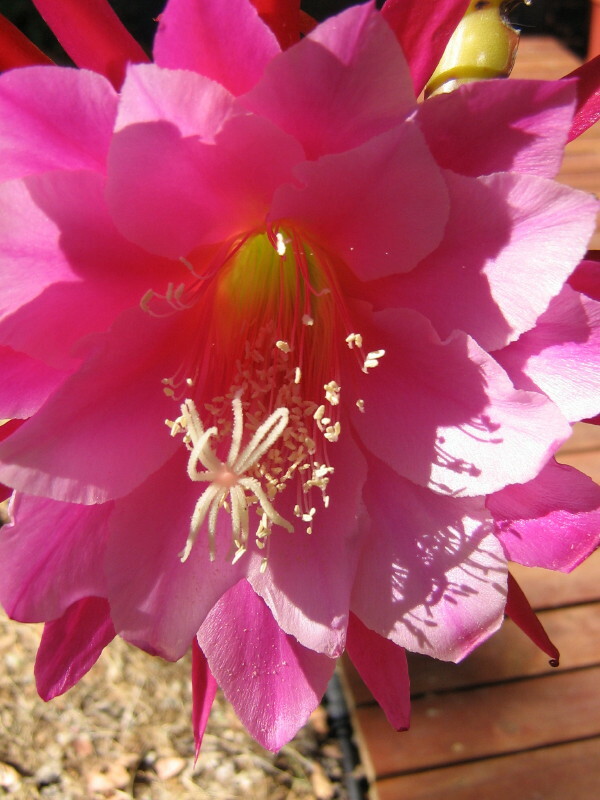 I think its proper name is epiphyllum, but I don’t know if it is a species plant or a hybrid. Another thing I should know more about!